Cray is building a supercomputer for the University of Edinburgh in Scotland that will deliver petaflops of performance, which could put it on a future list of top supercomputers. The supercomputer is being built as part of a $30 million contract awarded to Cray by the U.K. government’s Engineering and Physical Sciences Research Council, which funds postgraduate research. The supercomputer will be used for weather, life sciences, aerospace and other research, Cray and EPSRC said in a joint statement. The University of Edinburgh is home to one of the U.K.’s national supercomputing centers. 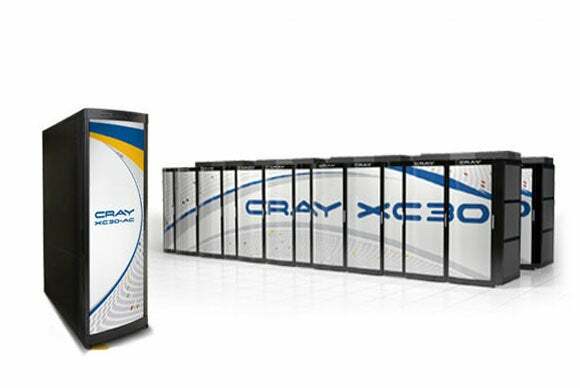 The Cray XC30 supercomputer will offer 5 petabytes of storage, and “100 gigabytes per-second of applications performance,” Cray said. A Cray spokesman declined to provide additional information regarding the components that will be used to build the supercomputer, but said it would provide “petaflops” of peak performance. The world’s fastest computer is the Tianhe-2 that is able to run at 33.86 petaflops and is located in China. The second fastest supercomputer is a Cray system called Titan, which clocks in at 17.59 petaflops at the U.S. Department of Energy’s (DOE) Oak Ridge National Laboratory. Twenty-six petaflop systems were listed in the most recent Top500 list, which measures the fastest supercomputers in the world. The list, released in June, also ranked the U.K. as the fourth-largest host of supercomputers, behind the U.S., China and Japan. The new supercomputer could fall in the top 15 systems in the next Top 500 list, said Dan Olds, principal analyst at Gabriel Consulting Group. The system will have the Aries interconnect, which is able to link to accelerators such as graphics processors or Intel’s Xeon Phi chip, Olds said. Most of the world’s fastest supercomputers today harness the joint computing power of CPUs and accelerators to crunch complex math and science applications. The storage capacity of 5 petaflops is also big and necessary for supercomputers, Olds said. Supercomputers regularly copy the state of the system to disk as backup. “Having that much storage is important to holding that state of the machine,” Olds said. The supercomputer will have an “innovative” cooling system and reducing the number of components will make it cheaper to maintain, Cray said. Companies regularly work with universities and countries on supercomputers. China worked with chip makers and system builders to develop Tianhe-2, while the U.S. government worked closely with Nvidia and Advanced Micro Devices on Titan.